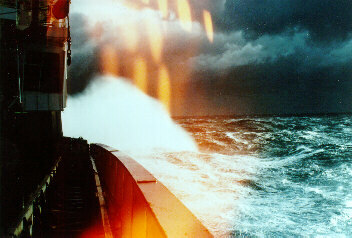 The purpose of this cruise was to measure the interhemispheric gradient of radiatively important trace species in the atmosphere, to quantify the ocean's effect on these trace gases in the surface waters, to measure the biological rate of production of dissolved N2O, and to compare these measurements to those from CMDL observatories. The NOAA Ship Discoverer, R 102, is about 93m long, cruises at about 14-16 knots maximum speed, and is staffed with around 50 crew members with a maximum capacity of about 40 scientists. It was one of the largest scientific vessels in the NOAA fleet and operated out of Seattle, Washington until it was retired in 1996. The main laboratory was located on main deck level close to the stern. The portholes of this lab can be seen in this picture left of the ladder from the raft that is tied to the ship. 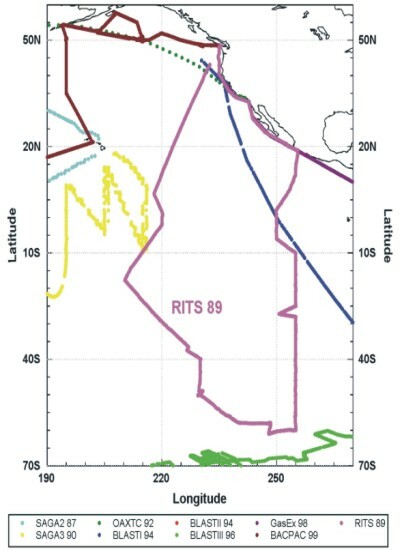 RITS 89 is shown in magenta through the East Pacific Ocean, out and back into Seattle, Washington. Oceanic Consumption of CH3CCl3: Implications for Tropospheric OH, J.H. Butler, J.W. Elkins, T.M. Thompson, and B.D. Hall, J. Geophys. Res., 96D, 22347-22355 (1991). Data is available on our anonymous FTP account ftp.cmdl.noaa.gov, subdir /hats/rits_89.